Rice is enjoyed in all parts of the world. And if you want to really appreciate eating rice, you should get the best rice cooker for you. There are different types of rice, and they’re cooked in many different ways. Eating properly cooked rice is the best, as you will get to enjoy its taste and texture better (mediocre rice and improperly cooked rice will not satisfy you, believe me). You may or may not be aware of it, but rice cookers have evolved through the years. Your choice in a rice cooker these days will range from the simplest types to the most intelligent units. 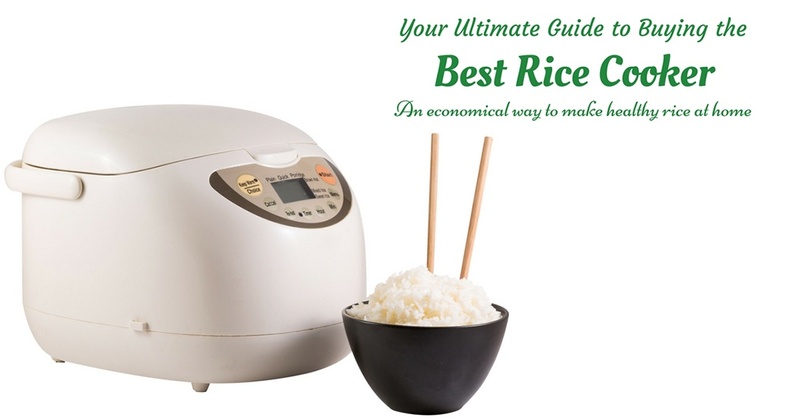 This article will provide you with all the facts that you need to make an informed (and wise) decision when choosing the best rice cooker for you. Don’t guess – you should get the model that will best suit your needs when it comes to cooking rice. Below, I will take up each type of the rice cooker and explain to you how each model works. This way, you’ll know all your options when choosing a rice cooker. A clay pot rice cooker is one of the oldest models of rice cookers. In the old days, these were just ordinary cooking pots – but they can cook great-tasting rice. 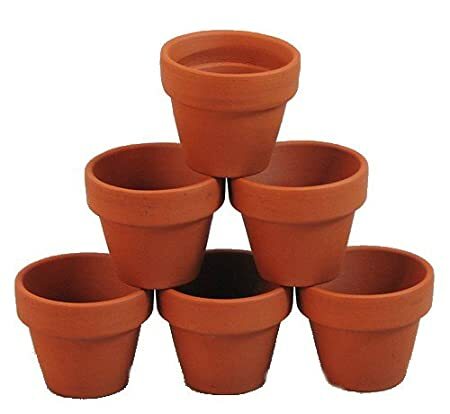 Since electricity was not yet invented, clay pots were used over open fires. These days, however, they can be used on electric stoves, gas stoves, and yes – over open fires (why not). Today’s clay pot rice cookers come in stylish designs (as new technology is being used to create them). And guess what – they can still cook delicious rice, just like in the old days. These clay pot rice cookers are actually still being widely used in Asian countries like Japan. As you can already tell, you will need a microwave oven if you’re going to use a microwavable plastic rice cooker. This model uses BPA-free, safe plastic materials. To use this type of rice cooker, you need to put uncooked rice and water in the plastic container pot. This microwavable pot then needs to be put in the microwave to cook. While the unit itself is non-electric, the microwave oven that you’re going to use is undoubtedly an electrical appliance. 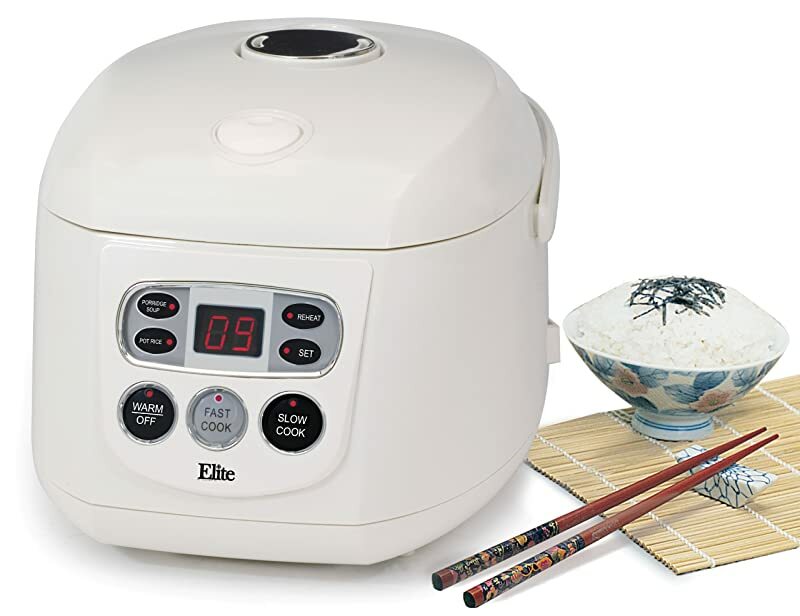 The Basic On/Off Rice Cooker is the oldest form of electric rice cooker. It’s still around today because it’s practical to use – especially if your only intention is to cook rice in it (that’s its main purpose, although it can also cook other types of food). To use this simple rice cooker, you just need to place uncooked rice and water in the inner pot. By pressing on a lever, the cooking process will begin and the rice will cook even without being attended to. The unit will automatically turn off the cooking mode when the rice is cooked and either switch to warm mode or off (depending on the unit). Because of its uncomplicated and simple design, this model of rice cooker will only produce good results in white (plain) rice. So, if you’re basically happy with eating ordinary white rice, this type of rice cooker will probably be fine for you. Programmable Rice Cookers are more sophisticated than basic on/off models. They come with programmable settings, and you will have a lot of options in cooking rice. 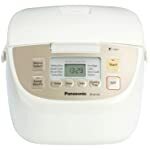 You can usually cook white rice, brown rice, sushi rice, and more with this type of rice cooker (they come with pre-programmed temperature and time settings for each type of rice). One of the basic settings seen in programmable rice cookers is the Steam option – and most of the time, you can use this function while cooking rice (you can cook rice while steaming vegetables). A Fuzzy Logic Rice Cooker has a built-in computer microchip that makes it an intelligent cooking device. So wise, in fact, that it can make decisions (while cooking) like a person. With basic and programmable rice cookers, the units will simply cook rice (or food) according to the built-in settings. However, with the Fuzzy Logic technology, the rice cooker can make adjustments in the settings (temperature and time) as needed. Having this feature will allow for the creation of perfectly cooked food all the time. 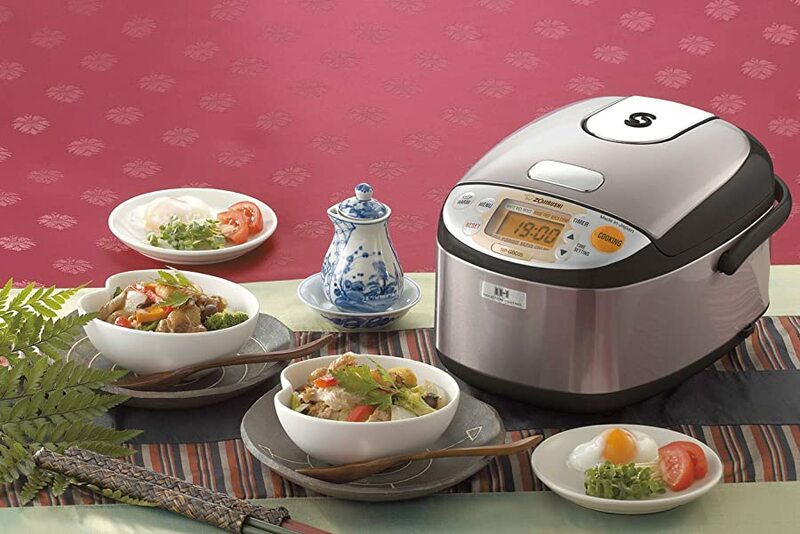 Induction Rice Cooker is the latest model of rice cooker (and therefore the most advanced). If you have an induction stove, know that an induction rice cooker uses the same technology. In induction﻿﻿ co﻿﻿oking, magnetic waves are used to produce heat when cooking food. This method is able to direct heat on the cooking food evenly to result in delicious, well-cooked dish. 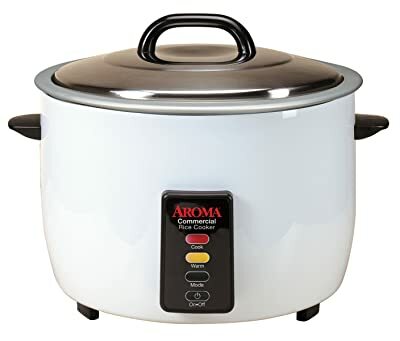 You only need a commercial grade rice cooker if you’re going to cook rice for a large number of people regularly (such as in a restaurant setting). You can get a model that can make 60 cups of cooked rice in one go with this type of device. As regular white rice is commonly served in restaurants, this model usually comes with a basic on/off functionality (like the basic on/off model for home use). 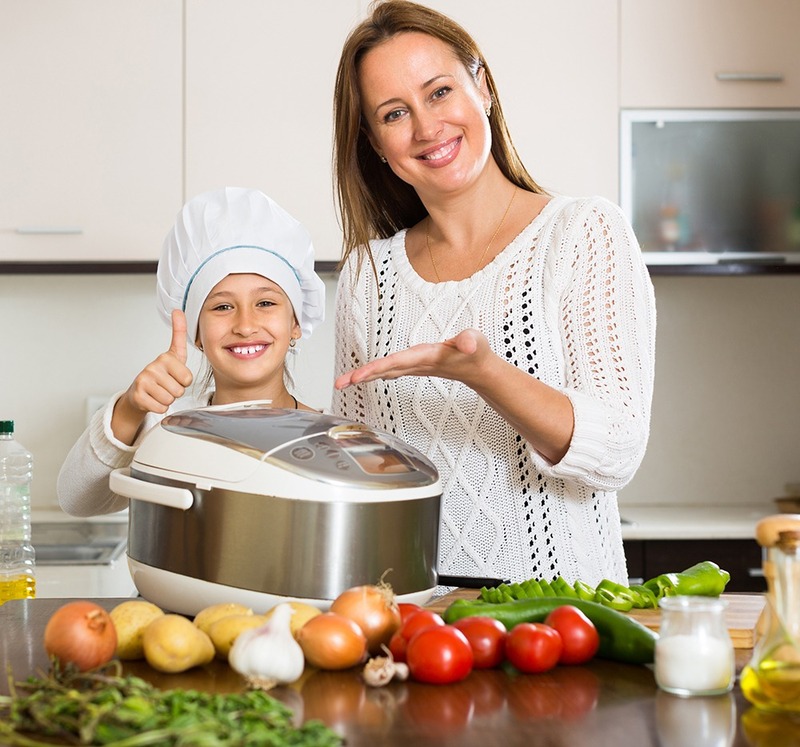 Now that you know your options in choosing a rice cooker, it’s time to understand some of the important factors to consider when looking out to buy a particular unit. The quality of the Inner Pot – The quality of the cooking pot is worth looking into before purchasing a particular model of a rice cooker. As your rice will cook in this pot, it should be safe to come into contact with food. Note that there are models that use aluminum materials for the inner pot – and the use of aluminum is now being linked to Alzheimer’s Disease. Teflon coating is also commonly used as the nonstick coating for the cooking pot – and Teflon is known to carry chemicals that can lead to cancer. Stainless Steel and ceramic are safer options as materials for the inner cooking pot. There are also non-Teflon nonstick coatings that are considered safe to come into contact with food during cooking. Capacity – You can choose from a 1 cup rice cooker, 2 cup rice cooker, 3 cup rice cooker, up to about 60 cup rice cooker (you have a wide range of options for the capacity of your rice cooker). So, think about the usual scenario in your household and how many cups of rice you usually need to cook. 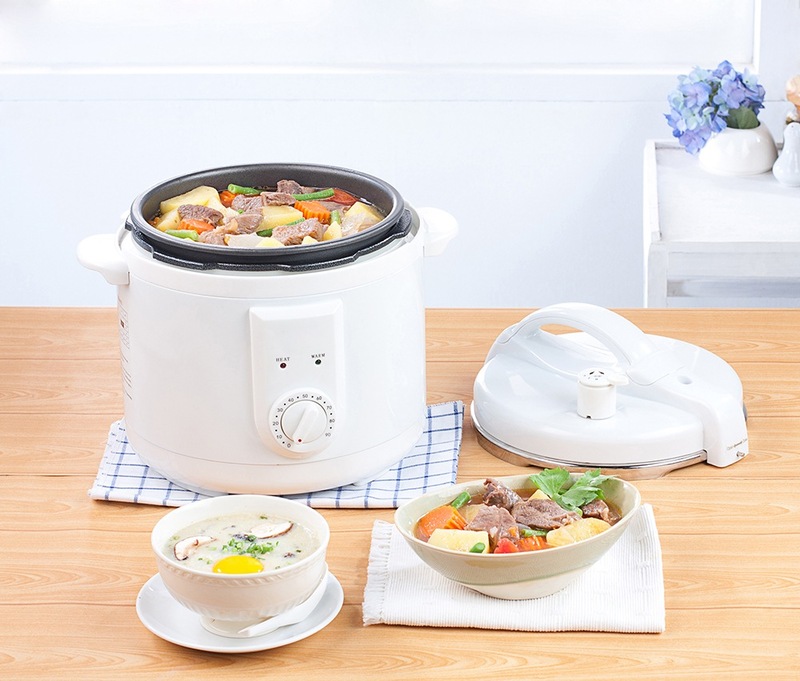 Operation – Get the model of rice cooker that’s most easy for you to use. If you want a non-electric model that can be used on the stove or microwave oven, that’s up to you. Or if you want a unit that comes with just the basic on/off function, that’s also your choice. And of course, you also have the option of getting a model that’s programmable and intelligent to handle your rice cooking needs and other types of cooking options. 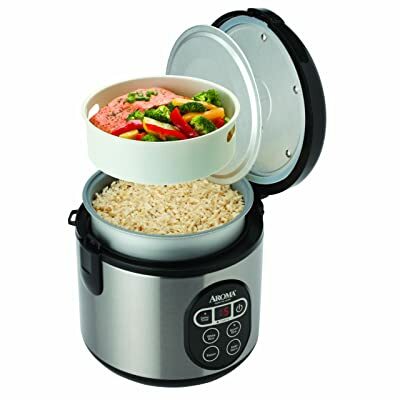 Features and Accessories – If you want a rice cooker that can make white rice, brown rice, sushi rice, and other types of rice, get a model that can do those things and more. Note that there are also rice cookers that also function as steamers and pressure cookers, among other things. Features such as a timer are also important if you want to set the time for your rice to cook. And safety features like auto shut off are just as important to keep everyone in your family safe. As for the accessories, this will depend on the particular unit you choose. A standard rice cooker package will include a rice paddle and a rice measuring cup. 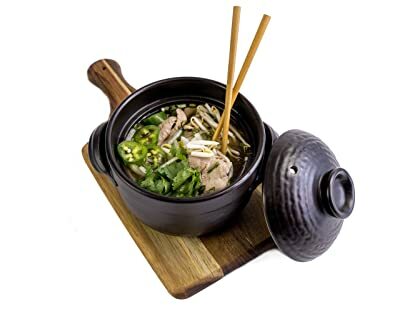 Some added (bonus) accessories can include a steaming tray, and the extra cup of measuring cup, a recipe book (for dishes you can cook in a rice cooker), etc. For this section of the rice cooker guide, I will explain to you how white rice, brown rice, and sushi rice are cooked in a rice cooker. You can use the information below as your basic guide, but the rice cooker you choose will have its own instructions (and rules) to follow when cooking these types of rice. This is the easiest to cook of all types of rice. The standard measurement for cooking this type of rice is 1 cup of water for 1 cup of uncooked rice. Since brown rice needs to be cooked at a low temperature so that it won’t turn out mushy, this type of rice takes a long time to cook (about twice the amount of time required for white rice). 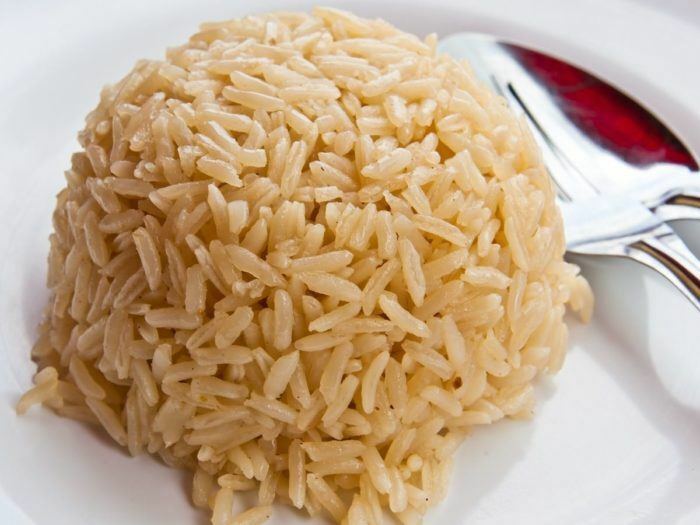 The standard measurement for cooking brown rice is 2 ½ cups of water for 1 cup of uncooked rice. As sushi rice needs to be firm, a 1:1 ratio for the uncooked rice and water is the standard measurement. Note that you still need to add vinegar to the sushi rice balls – so, making soft rice can really ruin the dish. Compared to brown rice, sushi rice cooks faster as this can be set at a higher temperature. Yes, it’s not that simple to make sushi rice in a rice cooker – thank goodness there are rice cookers with preprogrammed settings for this. For the review portion of this post, I am going to list down the Top 12 Best Rice Cookers on the market today. This will cover the unit’s features, pros and cons to help you decide on which product to buy. The Instant Pot IP-DUO60 model of pressure rice cooker comes with the Fuzzy Logic technology. It’s available in stainless steel and black (combination) color. 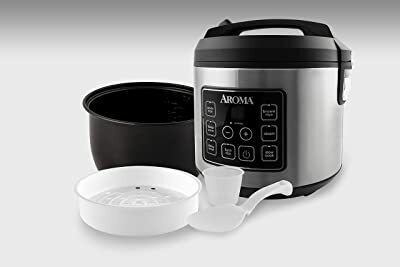 7-in-1 Design – This rice cooker is also a pressure cooker, slow cooker, saute/ browning cooker, steamer, warmer, sushi rice cooker, and yogurt maker. Capacity – It can make 10 cups of cooked rice. Safety Mechanisms – It comes with several safety features like lid lock system, pressure regulator, and more. Pressure Cooker Settings – Tough ingredients can be cooked at 11 PSI (at 70% less cooking time) and delicate food can be cooked at about 6 PSI. Cleaning Procedure – The cooking pot and steaming rack are dishwashers safe. The cooking pot and steaming rack are made of stainless steel. It comes with the 24-hour timer. The cooking pot comes with an aluminum bottom for even distribution of heat. The steaming rack has handles for convenience. It comes with large, easy-to-read control panel. The cooking pot doesn’t have a cover. You need to transfer any leftover cooked rice to another container with cover. Please know that this unit is first and foremost a pressure cooker (it functions best for this task). However, it is also a rice cooker – and a good one at that (it’s at the number 1 slot, see?). I like this model because it’s safe to use and its 7-in-1 design allows you to use it in 7 different ways. So, not only can you cook rice with this unit (white, brown, sushi, etc. ), you can also make meat and vegetable dishes, stews, soups – and even yogurt! Meet the Sistema microwavable rice cooker – it’s available in red color. Capacity – It can make 10.9 cups of cooked rice in full load. Cooking Design – As a non-electric unit, cooking and reheating is done in the microwave oven. Materials – It uses BPA-free plastic materials. Aside from being microwave oven safe, it’s also freezer safe. Lid Design – The lid comes with vents for releasing steam. Cooking rice is fast – it will only take about 12 minutes (applicable to white rice only). 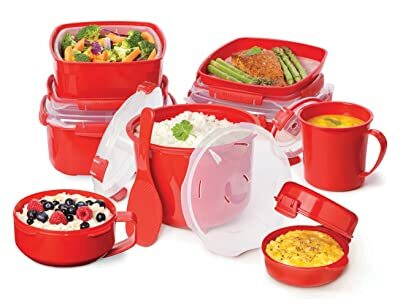 You can cook other dishes in this microwavable container. It’s simple to use and can make great tasting rice. It comes with a small handle (on the lid) for carrying. This model of rice cooker amazes me for its speed in cooking rice and its simplicity. While it’s made of plastic, it uses BPA-free materials that are safe to come into contact with food. 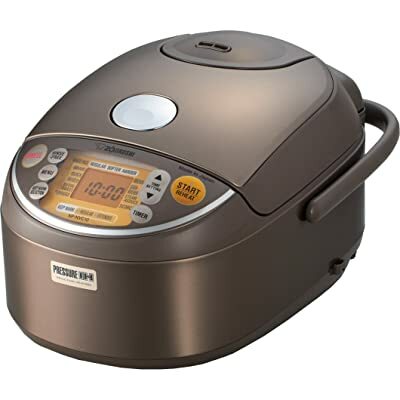 This is a good rice cooker for brown rice, white rice, etc. You can even use it for making other dishes in the microwave. The Japanese Style Donabe model of a non-electric rice cooker is a clay pot. It comes in the color black. Capacity – It can accommodate 1.5 cups of uncooked rice or 4 cups of cooked rice. Materials – It is made of natural earthen materials. Design – As clay contains alkaline elements, it will balance the PH level of acidic foods. Operation – It operates in slow, even cooking to produce delicate (fluffy) rice. Just put the pot on the stove (over medium heat) and your rice will cook the old-fashioned way. Cleaning Procedure – Hand wash the clay pot with mild soap and water. It’s fast cooking – white rice can be cooked in about 20 minutes. The unit looks good and unique. As a non-electric device, it’s an energy saver. It doesn’t contain toxic materials that can leak into the food that you’re cooking. It’s breakable, so be careful in handling it. I really like the design of this pot because it reminds me of the ancient times of cooking rice. In spite of its simple and old-fashioned design, it can make great rice (white, brown, sushi, etc.). You can also use it as a regular pot for cooking other types of food (since it’s a stove-top cookware). There’s no doubt about it – this is the best Japanese rice cooker in this Top 12 list. The Aroma Simply Stainless Steel rice cooker is a basic on/off the model of an electric rice cooker. It’s available in the color of white. Capacity – This model can hold 6 cups of cooked rice. If you’re using white uncooked rice, it can accommodate 3 cups. And if you’re using uncooked brown rice, it can hold 2 cups. One-Touch Operation – After putting the uncooked rice and water in the pot, just press the lever to start cooking. The unit will automatically switch to keep warm mode once your rice is done the cooking. Materials – The inner pot (cooking pot) is made of stainless steel. Accessories – The package includes a rice measuring cup and a serving spatula. Cleaning Procedure – You can either hand wash it or put it in the dishwasher. The cooking pot is made of stainless steel – and is, therefore, non-toxic. It comes in a compact design and won’t take up a lot of space in the kitchen. The glass lid makes it easy to monitor the cooking rice. It’s not that easy to clean since the pot is not layered with nonstick coating. The only way to shut off the unit is to unplug it. This is a small rice cooker that’s suitable for small families. It’s simple to use and will make the process of cooking rice (white, brown, sushi, etc.) very convenient. You can also cook oatmeal, soups, and chili in this rice cooker, too. This Zojirushi rice cooker uses induction and Fuzzy Logic technology with Artificial Intelligence – yes, it’s the most advanced rice cooker to date. This model is available in an attractive color of brown stainless steel. Capacity – It can hold 5 ½ cups of uncooked rice or 10 cups of cooked rice. 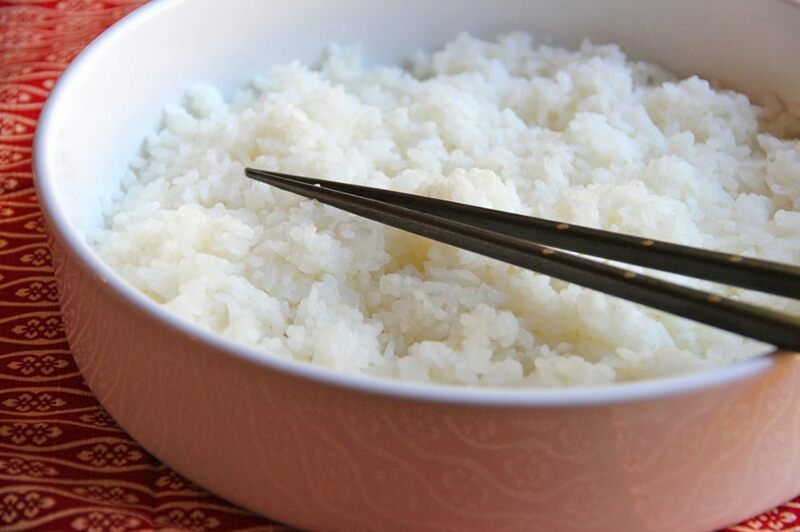 Functions – Among its many functions are White Rice, Brown Rice, Mixed Rice, Sushi Rice, Porridge, etc. Timer – It comes with a 24-hour delay timer. Control Panel – The LCD control panel is clear and easy to read. Cleaning Procedure – Hand wash with mild soap and warm water. The nonstick coating is infused with platinum materials (platinum stimulates alkaline production in food). It’s intelligent and can make “decisions” when adjustments in temperature and cooking time are needed. It provides for fast and even cooking because of the induction technology. 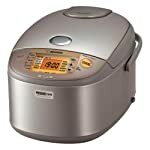 For me, this is the best rice cooker for sushi and the best rice cooker for brown rice and white rice. Because it’s an intelligent machine that uses induction technology, the taste and texture of the rice are maintained (like freshly cooked rice) even when it’s 2 days old. Also, as you can see in the review, its only con is that it’s pricey. 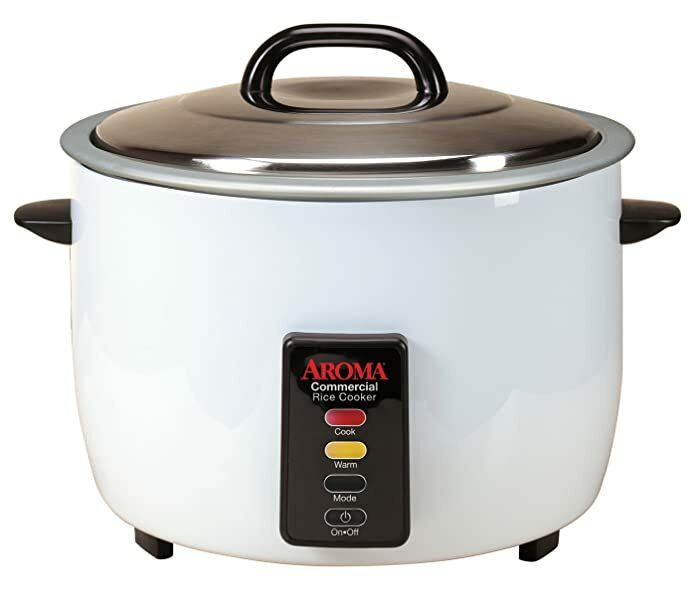 This Aroma rice cooker is a basic on/off model that’s made for commercial use. You can get it in white color. Capacity – The unit can hold 30 cups of uncooked rice or 60 cups of cooked rice. Operation – It involves one-touch operation (just press the lever down) to start the cooking process. It will automatically switch to Warming mode when rice is cooked. Lid – The lid or cover is made of stainless steel materials. Materials – The inner pot is made of aluminum with no coating. Cleaning Procedure – Hand washes the inner pot and steam tray. It comes with stay-cool handles. The package includes a rice measuring cup, a steam tray, and a serving spatula. The lid is made of heavy duty, durable materials. The inner cooking pot is made of aluminum. This would have been a perfect commercial grade rice cooker if the cooking pot was not made of aluminum materials. The price is really good and the features are simple and functional. I’m just glad that the aluminum pot is not coated with nonstick Teflon-like other Aroma rice cookers. 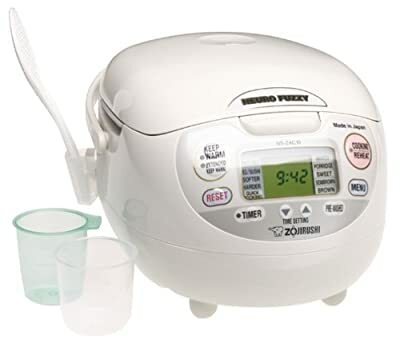 This is a Fuzzy Logic rice cooker from Zojirushi, and it comes in white color. Menu Selections – There are several menu options to choose from including white rice, brown rice, sushi rice, porridge, etc. Pre-Programmed Settings – One-touch button settings include reheat, keep warm, extended keep warm, etc. Timer – It comes with 13-hour timer. Cleaning Procedure – Hand wash with mild soap and water. The cooking pot makes use of stainless steel materials which are safe to come into contact with food. The package includes 1 regular rice measuring cup, 1 no-rinse measuring cup, and a rice paddle. It comes with retractable cord. The carrying handle makes the rice cooker portable. It comes with the nonstick Teflon coating, which is known to release cancer-causing chemicals. I really like everything about this Zojirushi rice cooker, except for the price and Teflon coating. It’s great for medium sized families, and it’s capable of cooking white rice, brown rice, sushi rice, and more. 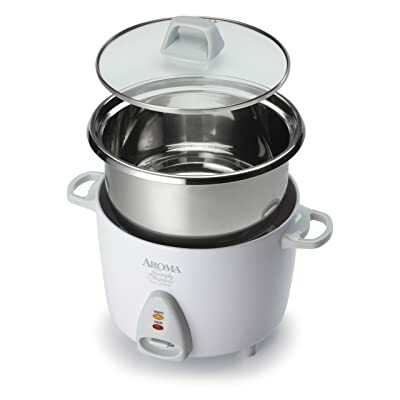 Equipped with Fuzzy Logic technology, Aroma Housewares ARC-914SBD rice cooker is available in stainless steel color. 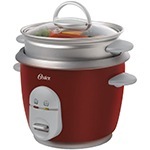 Capacity – This model of rice cooker can hold 4 cups of uncooked rice or 8 cups of cooked rice. 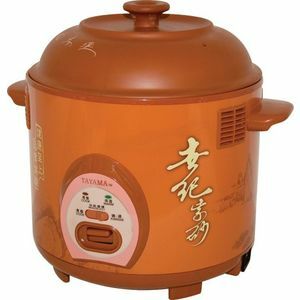 Functions – The included functions on this unit are: White Rice, Brown Rice, Steam, and Keep Warm. Accessories – The Package includes a rice measuring cup, a serving spatula, a steam tray, and rice cooker recipes. Cleaning Procedure – The inner cooking pot and included accessories can all be washed in the dishwasher. You can cook as little as ½ cup of uncooked rice. The steam tray is made of BPA-free plastic. It cooks fast – 2 cups of white rice can be cooked in about 12 minutes. You have the option of just using the steam function of the unit. The cooking pot is made of aluminum with a nonstick Teflon coating. 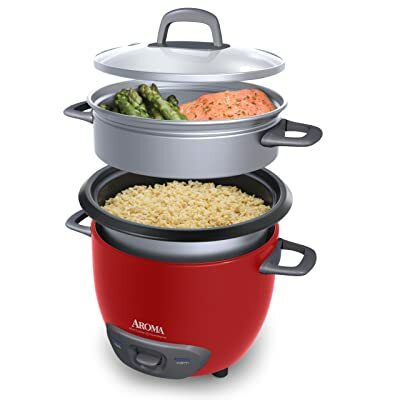 I like this model of rice cooker from Aroma because it’s a 2-in-1 cooking device (rice cooker and steamer in one). If it wasn’t for safety issues because of the aluminum and Teflon materials in the cooking pot, this unit would have ranked higher in this Top 12 list. This model of Aroma rice cooker comes with Fuzzy Logic technology. The available color for this model is stainless steel and black (combination). Capacity – It can hold 10 cups of uncooked rice or 20 cups of cooked rice. Functions – Here are some of the functions included in this model: White Rice, Brown Rice, Steam, Slow Cook, and Keep Warm. Timer – It comes with a delay timer of 15 hours. Accessories – The package includes a rice measuring cup, a serving spatula, a steam tray, and recipes. Cleaning Procedure – The inner cooking pot can be washed in the dishwasher. You can do the simultaneous cooking in this rice cooker (cook rice and steam food at the same time). Although it has a maximum capacity of 10 cups of uncooked rice, you can cook just 1 cup of uncooked rice. The plastic parts are all BPA-free. It cooks rice fast – about 30 minutes for 2 cups of white rice. The cooking pot is made of aluminum and it’s coated with Teflon. Because of the safety issues involved in the use of aluminum and Teflon materials, this rice cooker is not highly recommendable. Too bad, it would have been a great all-around cooking device as it can cook rice, soups, chili recipes, and steamed dishes. It would have been suitable for large families, too. This basic on/off rice cooker from Oster is as simple as it can get when it comes to electric rice cookers. It’s available in red color. Capacity – It can accommodate 3 cups of uncooked rice or 6 cups of cooked rice. 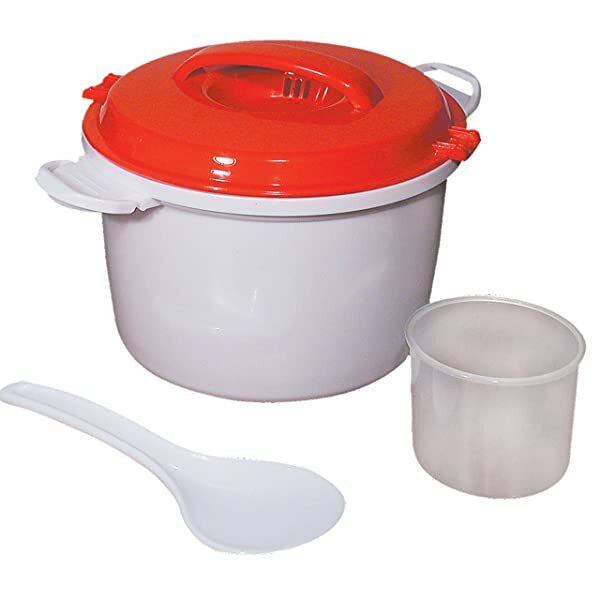 Accessories – The package includes a steam tray, a glass lid, a rice measuring cup, and a rice paddle. Auto Keep Warm – The unit automatically switches to keep warm mode once the rice is cooked. Operation – When the rice and water are put into the cooking pot, all you have to do is press the lever down to start the cooking process. Cleaning Procedure – The cooking pot and steam tray are dishwashers safe. There’s an indicator light when the unit is in operation. The inner pot is made up of aluminum materials. And the nonstick coating is made of Teflon. This Oster rice cooker would have ranked higher in the Top 12 if it wasn’t for the aluminum pot that’s coated with Teflon. I like its simplicity, and it would have been useful for a small family. 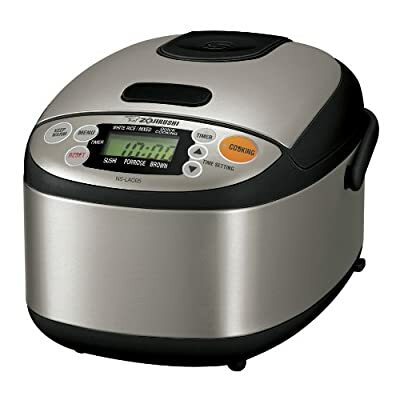 Aside from rice, this rice cooker can also make soups and steamed dishes. With Fuzzy Logic Technology, this Zojirushi rice cooker 3 cup model is available in the color of black stainless steel. Capacity – It can hold 3 cups of uncooked rice or 6 cups of cooked rice. Functions – Its built-in functions include White/Mixed, Brown, Sushi, Porridge, and Quick Cooking. Control Panel – A clear LCD Control Panel makes it easy to program the unit. Cleaning Procedure – It’s advisable to hand wash the inner pot and included accessories. There are measuring lines inside the cooking pot to serve as a guide as to the amount of rice and water to be used. It comes with easy-to-read LCD. 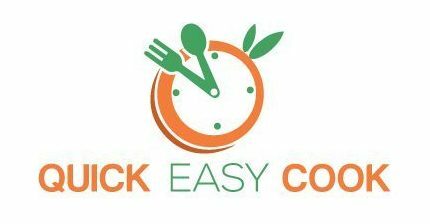 Timer – The cooking process can be delayed up to 24 hours. It can make delicious rice – especially white rice, brown rice and sushi rice. I really like this Zojirushi rice cooker because it can effectively cook white rice, brown rice, and sushi rice. However, it uses an aluminum pot with Teflon coating – a terrible combination for a cooking pot. I would have recommended it for couples and small families. The Aroma Housewares Pot Style is a basic on/off rice cooker. This model is available in the following colors: red, black, and white. 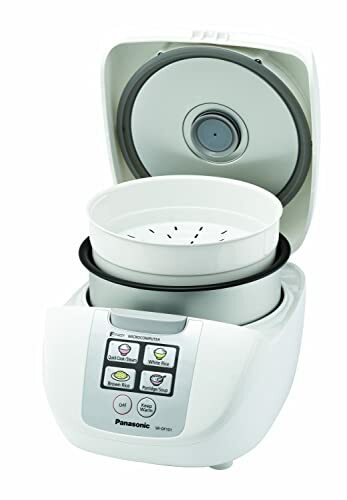 Functions – Aside from cooking rice, it also works as a steamer. Accessories – The package includes a steaming tray, a rice measuring cup, a serving spatula, and recipes. Operation – Pressing down the lever will start the cooking process. Once the rice is done the cooking, it will switch to the Keep Warm mode. Cleaning Procedure – The inner pot is dishwasher safe. It cooks fast – 3 cups of rice can be cooked in about 30 minutes. It comes in a versatile design, allowing you to use the steam function only. It looks good and there are 3 colors to choose from. The operation is simple and the unit is easy to use. The cooking pot is made of aluminum and it comes with Teflon coating. The unit gets very hot during cooking – you need to let a few minutes pass by before handling it. As a simple rice cooker, this model can make great-tasting white and brown rice. Also, its size is ideal for small families. It has a lot of good qualities, but its major flaw is the cooking pot’s construction since it’s made of aluminum and Teflon materials. The Top 12 rice cookers in this post were compiled through detailed research on all the best models of this type of kitchen appliance. While they may not be all perfect, you will find that there are lots of good rice cookers on the list that are worth considering. I will take this opportunity to give you my suggestions. 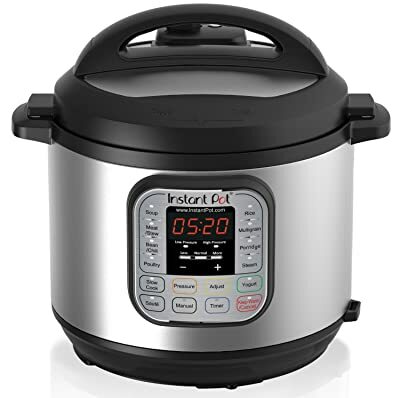 As you can see, I rated the Instant Pot 7-in-1 in the number 1 slot – I really think it’s the best rice cooker on the list. It’s also a multipurpose cooking device, so it really serves a lot of purposes. At number 2 on the Top 12 list is the Sistema, a microwave rice cooker. 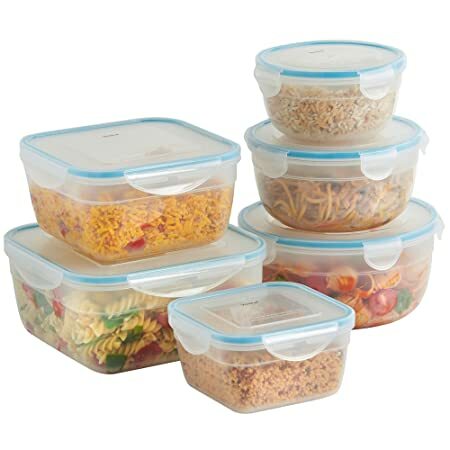 It’s cheap, easy to use, microwave oven safe, and freezer safe – what’s not to like? The model at number 3 is a Japanese rice cooker. The Japanese Style Donabe is a clay pot (non-electric) rice cooker. It’s pretty, easy to use, and cooks rice fast. It’s also an affordable rice cooker – one of the best reasons to get it. At number 4 is a basic on/off rice cooker – and for me, it’s the best small rice cooker in our Top 12 list. If this is the model you want, the Aroma Simply Stainless is a simple (old-fashioned) rice cooker that can surely satisfy your needs. I placed the Zojirushi Induction at number 5 because it’s the most intelligent rice cooker on the list – its only con is its high price. The last of my recommendations is positioned at number 6. This is a commercial grade model that’s suitable for restaurant use. Its only major flaw is that the inner pot is made of aluminum materials. All the other units in the Top 12 list are also good (just look at their many features). The only reason why I am not recommending the last 6 products on the list is because they either use aluminum materials for the cooking pot or have Teflon nonstick coating (or both). If you’re one of those people who doesn't mind cooking in aluminum and Teflon, then the other units are also worth considering when making your choice. A rice cooker is really a practical kitchen appliance, especially if you eat rice once in a while (or quite often – making it an even more essential item in your kitchen). To each his own, that’s why I included different types and models in the Top 12 list of the best rice cookers on the market. If you enjoy eating rice (like me), get the model that’s most suitable to your needs. This will make the long and complicated process of cooking rice simpler. Life goes on, as rice cooks in the best rice cooker. Let me know your thoughts by leaving a comment below. Also, make sure that you share this post with other people who are also looking out to buy a rice cooker.